My name is Jose Sandoval, and I'm a software developer. I consult on all areas of software engineering. You can reach me at jose@josesandoval.com. 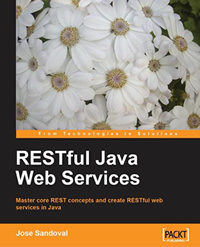 If you are interested in RESTful web services, I wrote a book titled RESTful Java Web Services . I was named after my father (Jose) and my grandfather (Felix). The Sandoval last name comes from a little town located in the northern part of the province of Burgos, Spain, called Sandoval de la Reina. One of the first Sandovals to have set foot in the continent of America was Gonzalo de Sandoval, a conquistador who was led by Hernan Cortez in 1519. As with many Spanish last names, a coat of arms for it exists. The color gold means generosity and intellectual pursuit; the black scarf or knight's shield suspender means protector; the helmet signifies wisdom, strength, and invulnerability. Although the short term gains of outsourcing development to a county like India are not disputed, the long term sustainability of such decisions are still up for debate, at least in the software engineering industry. And when I say long term, I mean 10 to 20 years, not 3 quarters in the future. I have read Wikinomics and The World is Flat , and I believe specialization together with outsourcing are the future of software development--half of my business is outsourced work--but the business fundamentals will always remain: it's about offering a superior product at profitable prices (for the producer and consumer). Once the labour costs increase shaving off whole percentage points of the ROI, important decisions have to be made; most of the time this means a decrease in cost, and sadly labour is a cost. A real example of this can be found here: India grows up. Of course, there are success stories, but we know that sometimes things don't work out and those don't get published in the mainstream media. What are your thoughts on outsourcing key components of a system outside of North America? By system I mean a complex software system--call centers and such don't count. Note that I consider Canada and the US to be at par in high technology expertise, so development projects moving between the US and Canada is just business as usual. For the sake of my argument, I only consider outsourcing companies outside these two countries, i.e., I am not too familiar with other countries' overall technical knowledge. The reality may be that these countries may in fact have superior labour forces, but I just don't know from first-hand experience. And of course, if this were the case, the market would make sure to spread the word.